Following our indulgence of Philly cheesesteaks, my family and I were in the mood for something sweet. We wanted dessert that was a bit different than the usual ice cream pick. As we searched, we discovered a coffee and pie spot that wasn't too far from our current location. 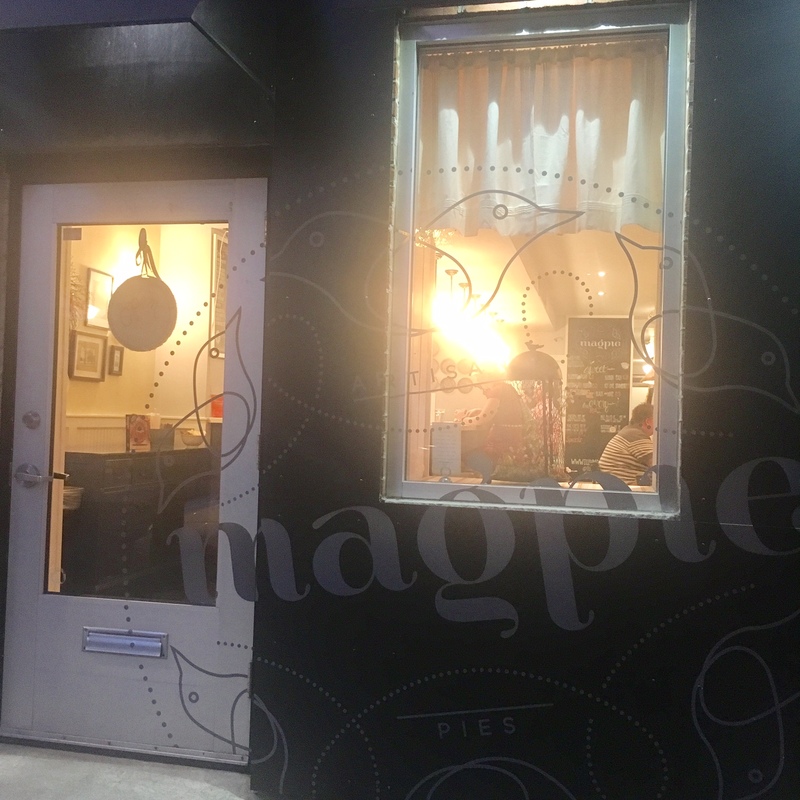 Magpie is a pie spot that offers seasonal pies made by hand. It is located in a cute little area that seems to have a cool foodie feel to it. The store is quite small with a long bar countertop area as well as a few tables surrounding it. The interior is simple, but cute, reminding you that you just stepped into something that resembles Anthropology. The menu is basic with pies, coffee, and ice cream. CAPPUCCINO ($3.75): The cappuccino was delicious. It was thick and frothy and had a cute heart design. The espresso had the perfect amount of strength that I didn't even need to add sugar. GHIRADELLI WHITE HOT CHOCOLATE ($4.00): with house made marshmallow. This was delicious. The marshmallow wasn't the typical jetpuff marshmallow. It was light and airy and the white chocolate was sweet but not overly sweet. It was a good drink if you like hot chocolate and want something a bit different. BLUEBERRY CRUMB A LA MODE ($6.00 +$2.50 FOR ICE CREAM): I thought this pie was just ok. I loved the crumb topping cause it is one of my favorites, but the whole pie altogether didn't amaze me. The crust had a nice buttery texture. I wasn't a fan of the ice cream. It was just way too crystalized and icy and lacked the creamy consistency I always look for in ice cream. BUTTERSCOTCH BOURBON ($5.25): I really enjoyed this pie. I'm a fan of butterscotch so a butterscotch pie made my dreams come true. It was creamy and buttery and the bourbon was really subtle. It was not too heavy and the crust was flaky. A good overall pie. MY FAVORITE. BLACK AND WHITE ($5.50): This was a really good pie. It was rich with chocolate undertones without being overly decadent. I loved all the textures, from the buttery pie crust, to the creamy filling all the way to the crispy chocolate balls. It was a pie party in my mouth. Overall, Magpie is a great dessert spot if you're looking for something different than the common ice cream. It is fairly small and cozy and offers great coffee options for the coffee lovers. They also have pie milkshakes where you can pick your favorite pie flavor and turn it into a drink! Additionally, if you're into savory pies, they have that too! Basically, it's a win-win situation for all.